A laminated glass window has approximately the same impact resistance as a toughened piece of glass with the same thickness. A significant added advantage of laminated glass is the security aspect. When a laminated glass window is broken, the glass shards adhere to the adhesive layers rather than scatter about. This factor is a benefit in applications such as cockpit displays, public information displays, and factory production line controls. This avoids damage to the high value display and injury to persons from broken glass. Non-glare etched glass is a high grade dispersive finish and is a cost effective solution. 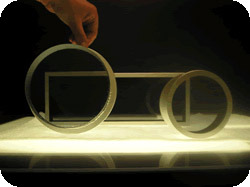 Multi-layer anti-reflective coatings (MLAR or AR) reduce the surface reflections and optimise the light transmission. Fully laminated glass and polycarbonate screens of a thickness greater than 12 mm. Typically, for high impact applications, including ballistic resistance, the glass can incorporate EMI shielding and transparent heaters. Glass touch screens can be strengthened by full optical lamination of additional glass layer and/or polycarbonate onto the rear surface. A lamination solution is stronger, thinner and safer than the alternative solid thick glass touch screens. Typical applications are ATM's, gaming, ticketing and public kiosks. Privacy screens can also be included as part of the same lamination. Food & medical processing equipment should have strengthened screens to protect the display and the production line. Polycarbonate laminated windows are usually specified in these circumstances where there should be no risk of glass splinters contaminating the food.